Click Images for Larger Views. Please Review Policies Page For More Details About Placing An Order Online Before Your Purchase. 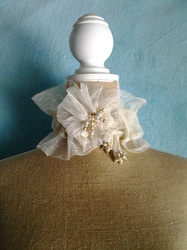 The Hand Beaded Removable Ruffle Collar is a unique accessory that compliments any special occasion! 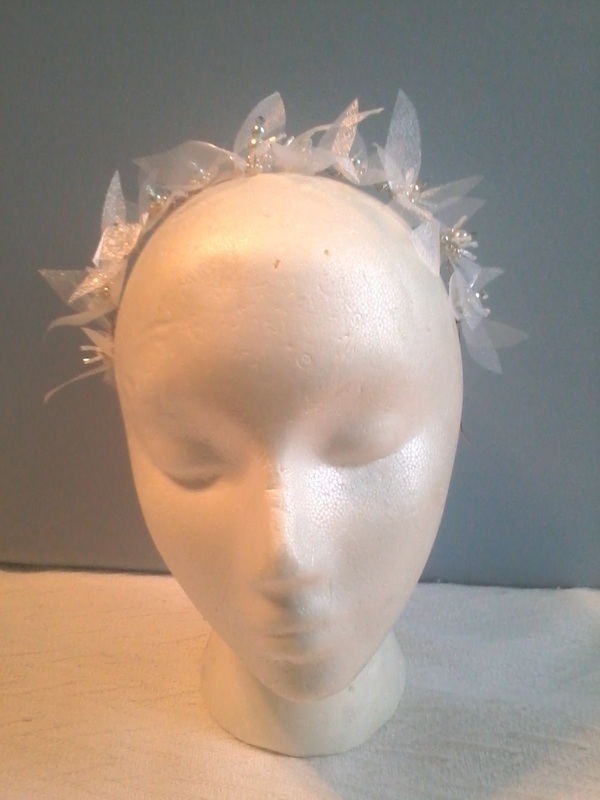 Initially an addition to wedding gowns in the current gown collection, sold separately it could be a great accessory for the bridal party! Each hand beaded removable ruffle collar is approximately 41 inches in length. The end of each draw string is covered beautifully with hand beading! Created in a neutral palette, the color of the ruffle collar and intricate hand beading with Swavorski Elements can be customized to the color specifications of the bride. One size fits all. The Hand Beaded Removable Ruffle Collar is available in Silk Velvet, Velvet, Organza, Tulle and Point d'Espirit Lace fabrics. Please specify your preference through email when ordering. The company label is sewn discreetly in the neck of the collar. The Care Instructions are included with purchase. This item can be shipped in a lined presentation box or in a breathable cloth storage bag. Regular Price $75.00. 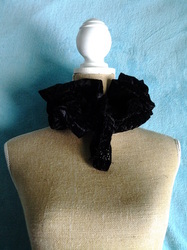 The Black Velvet Ruffle Collar in 5 Different Ways! Ruffle Collars are not just for brides anymore! This image is property of Sun*Kissed Designs. The Silk Velvet Ruffle Collar in Cream and the Point d'Espirit Ruffle Collar in Cream shown with 5 Different Looks! This image is property of Sun*Kissed Designs. The Dragonfly Flower Ruffle Collar in Dusty Rose and Turquoise shown paired with the Blessed Bridesmaid Dress and with 3 additional looks! This is a great way to accessories the bridal party! This image is property of Sun*Kissed Designs. The Hand Beaded Removable Ruffle Collar in Silk Velvet fabric. The end of each draw string is covered beautifully with hand beading and Swavorski Elements ! Please specify either black or cream as your color choice in an email to chantelfrancina@sunkissedbridal.com. Regular Retail Price $75. The Hand Beaded Removable Ruffle Collar in Velvet fabric. The end of each draw string is covered beautifully with hand beading and Swavorski Elements! Please specify either black, white or cream as your color choice or a custom color request in an email to chantelfrancina@sunkissedbridal.com. Regular Retail Price $75. The Hand Beaded Removable Ruffle Collar in Organza fabric. The end of each draw string is covered beautifully with hand beading and Swavorski Elements! Please specify either black, white or cream as your color choice or a custom color request in an email to chantelfrancina@sunkissedbridal.com. Regular Retail Price $75. The Hand Beaded Removable Ruffle Collar in Point d'Espirit Lace fabric. The end of each draw string is covered beautifully with hand beading! Please specify either black, white or cream as your color choice in an email to chantelfrancina@sunkissedbridal.com. Regular Retail Price $75. The Hand Beaded Removable Ruffle Collar now presented in Tulle fabric as the Dragonfly Flower Ruffle Collar! 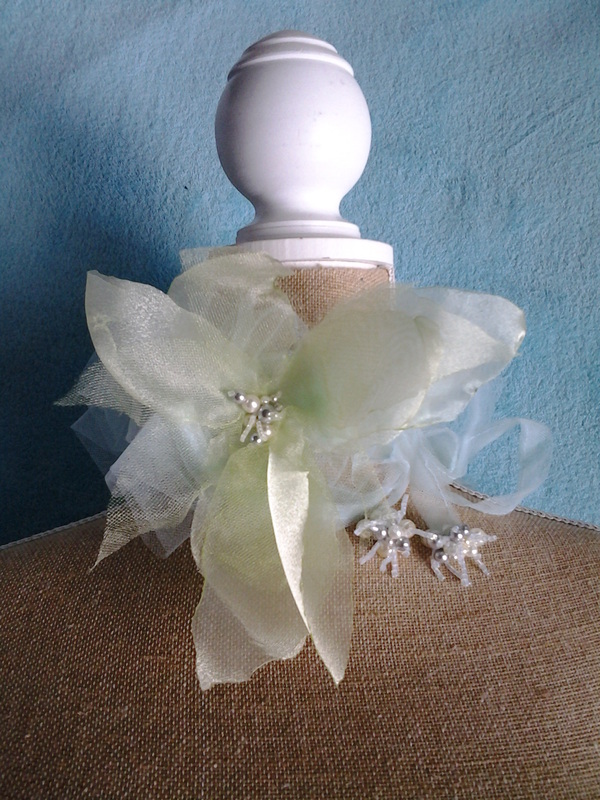 The same lovely ruffle collar design created in turquoise tulle fabric with a citrus green organza lily flower. 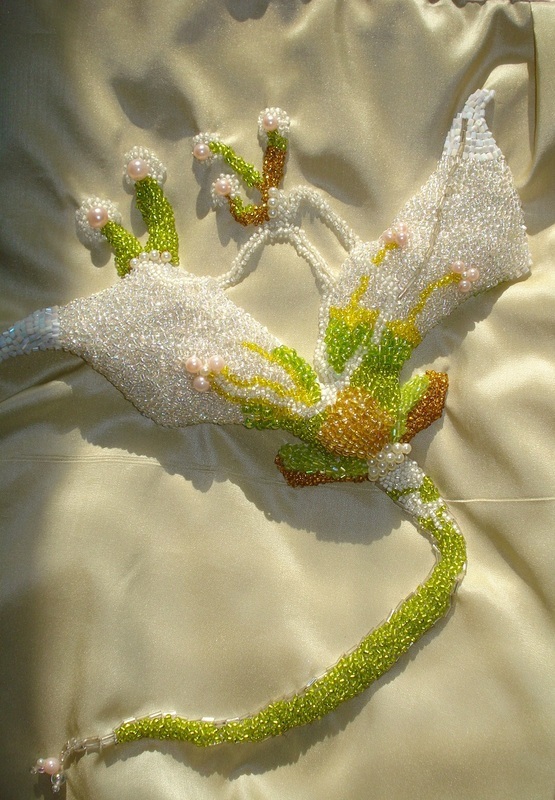 The end of each draw string is covered beautifully with hand beading! This selection comes in turquoise and dusty rose. For custom color request please email chantelfrancina@sunkissedbridal.com. Regular Price $75. Hand Beaded Ruffle Collar in Silk Velvet Cream. Hand Beaded Ruffle Collar in Organza White. 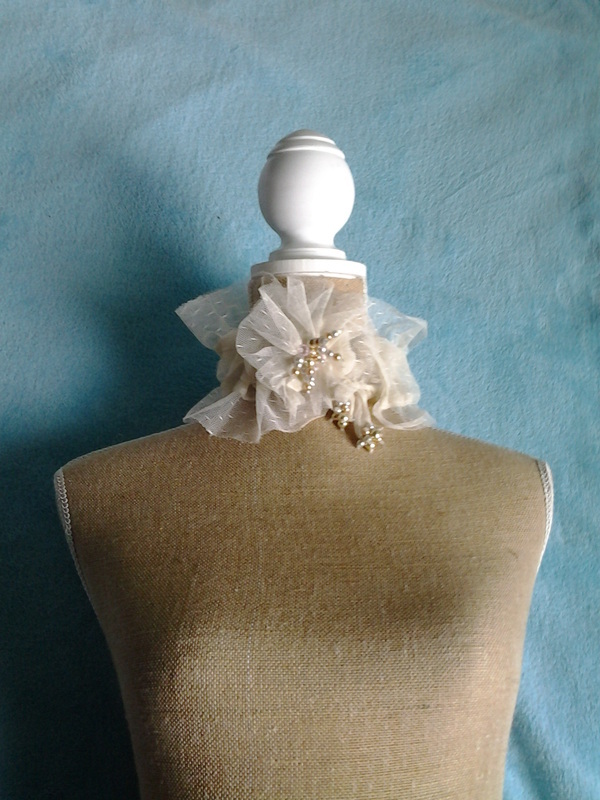 Hand Beaded Ruffle Collar in Point d'Espirit Lace Cream. 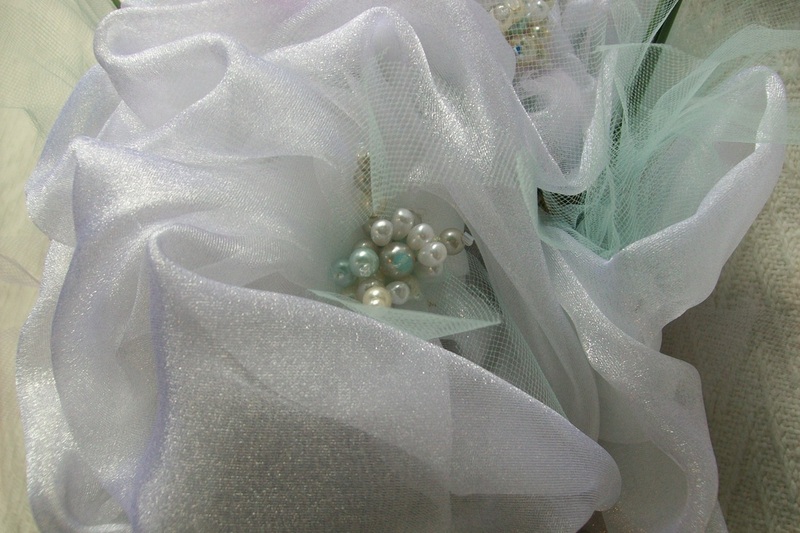 Hand Beaded Ruffle Collar in Dragonfly Flower Tulle Turquoise. Hand Beaded Ruffle Collar in Dragonfly Flower Tulle Dusty Rose. The Large Hand Beaded Flower Shawl has a full sized flower that is intricately hand beaded with seed beads, pearls and Swavorski Elements sewn on neutral taffeta and silk fabrics . 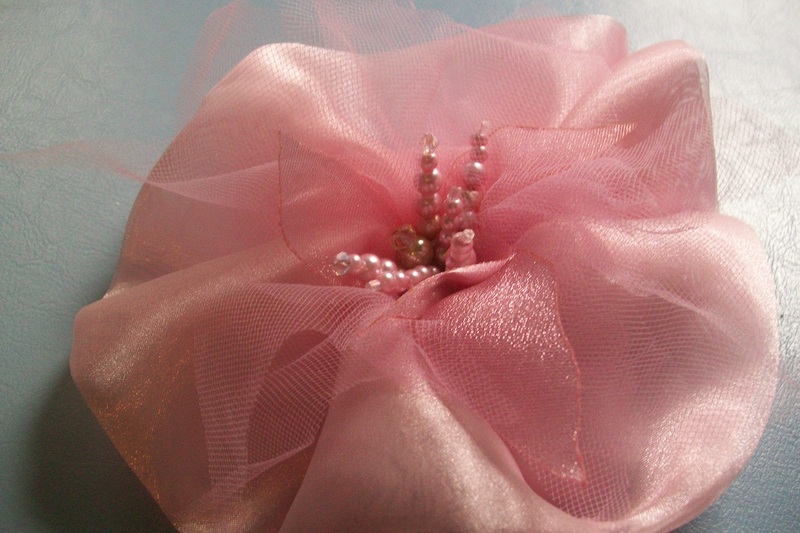 The color selection of the fabric and the bead work can be customized. The shawl is approximately 80 1/2 inches in length and 19 inches in width. One size fits all. 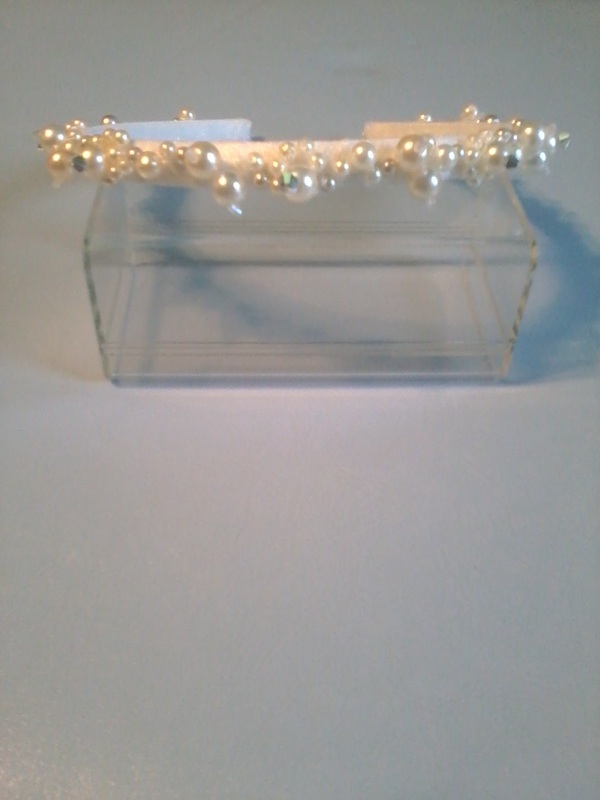 This is the perfect accessory of gift for members of the bridal party, especially mothers of the bride! 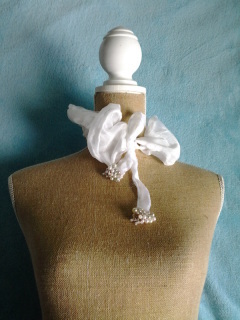 Each shawl comes with a decorative shawl pin. The company label is sewn discreetly in the neck of the collar. The Care Instructions are included with purchase. This item can be shipped in a lined presentation box or in a breathable cloth storage bag. Regular Price $250.00. The Hand Beaded Floral Head Scarf is one size fits all. One large, beaded petal rosette adorns the side as a hand beaded seed bead leaf leads to 4 rustic nests all hand beaded with neutral and pink pearls and silver Swavorski Elements. Ivory colored tulle. 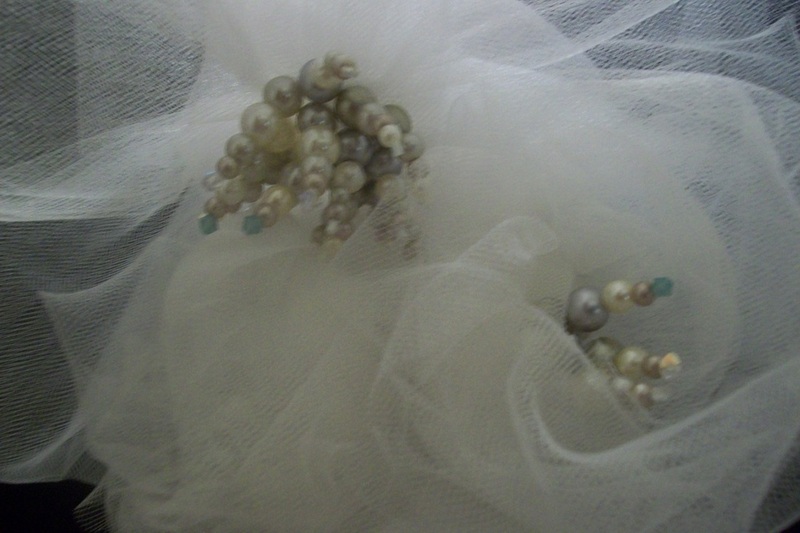 The color combinations of the beading as well as the tulle for the scarf can all be customized to color specifications of the bride. The company label is sewn discreetly in the back of the scarf. The Care Instructions are included with purchase. This item can be shipped in a lined presentation box or within a breathable storage bag. Regular Price: $50.00. The Hair Fascinators are approximately 13 inches in circumference. Each is handmade and contains handmade floral elements. 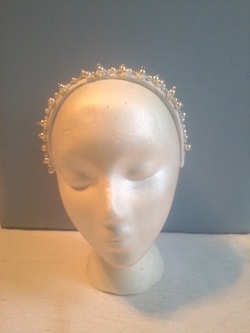 It attaches to the hair by a plastic hair comb that is sewn to the fascinator. 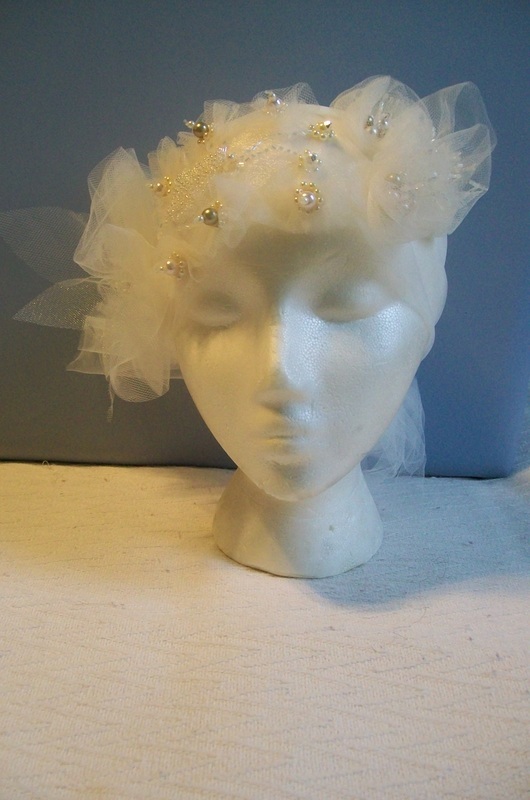 The color of the fascinator and the intricate hand beading with Swavorski Elements, can be customized to the color specifications of the bride. It is suitable for all hair textures. The company label is sewn discreetly over the comb on the back of the fascinator. The Care Instructions are included with purchase. This item can be shipped in a lined presentation box or within a breathable storage bag. 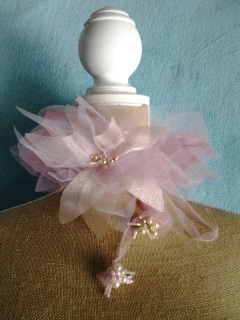 Regular Price: $35.00. 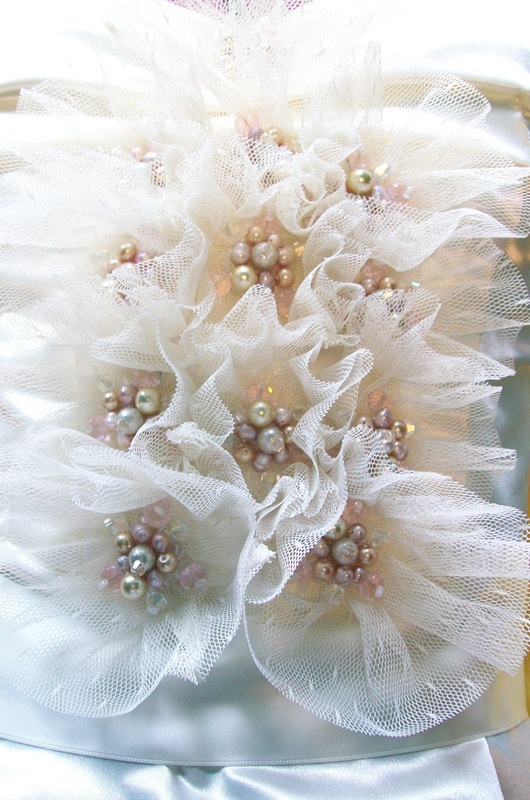 The Hand Beaded Removable Ruffle Caplet is another unique accessory that compliments any special occasion! Initially an addition to wedding gowns in the current gown collection, sold separately it could be a great accessory for the bridal party! Each hand beaded removable ruffle caplet is approximately 63 inches in length. The end of each draw string is covered beautifully with hand beading! Created in a neutral palette, the color of the ruffle caplet and intricate hand beading with Swavorski Elements can be customized to the color specifications of the bride. One size fits all. The Hand Beaded Removable Ruffle Caplet is available in Silk Velvet, Organza, and Point d'Espirit Lace fabrics. Please specify your preference through email when ordering. The company label is sewn discreetly in the neck of the collar. 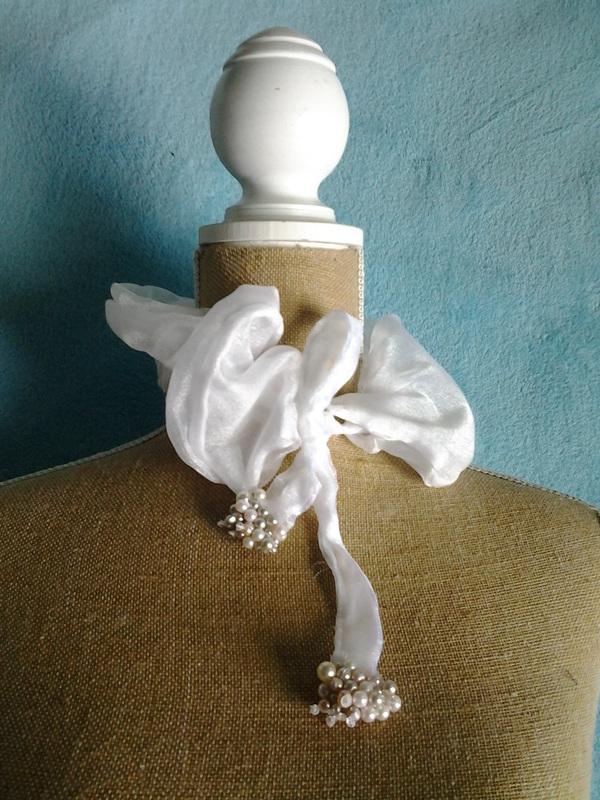 The caplet in the image to the left was created with 1 extra large beaded rosette. This can be removed upon request. The Care Instructions are included with purchase. This item can be shipped in a lined presentation box or in a breathable cloth storage bag. Regular Price $100.00. The Shrug is a beautiful accessory for both the bride and her bridal party! The pleated, sleeveless shrug fits from collar to mid back with front descending flaps that help conceal the shoulders. 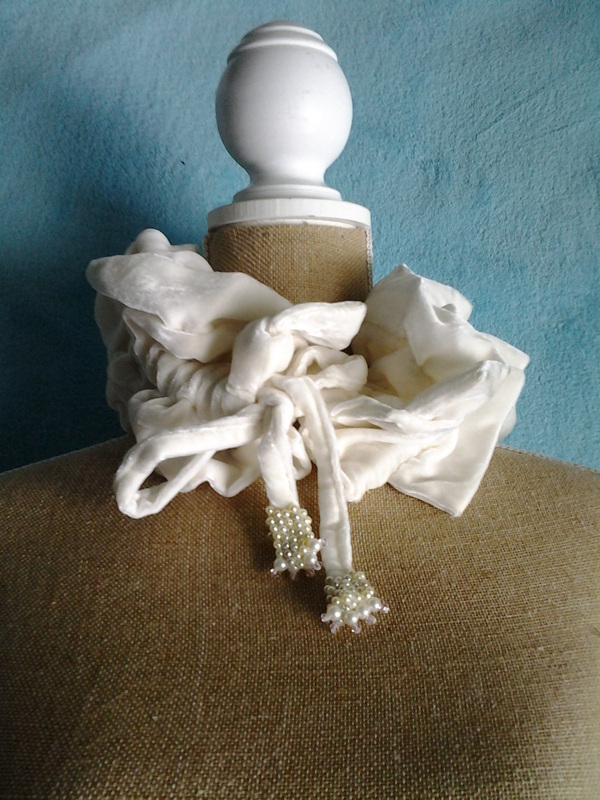 3 Organza Hand Beaded Rosettes adorn the shoulders to create an asymmetric design. 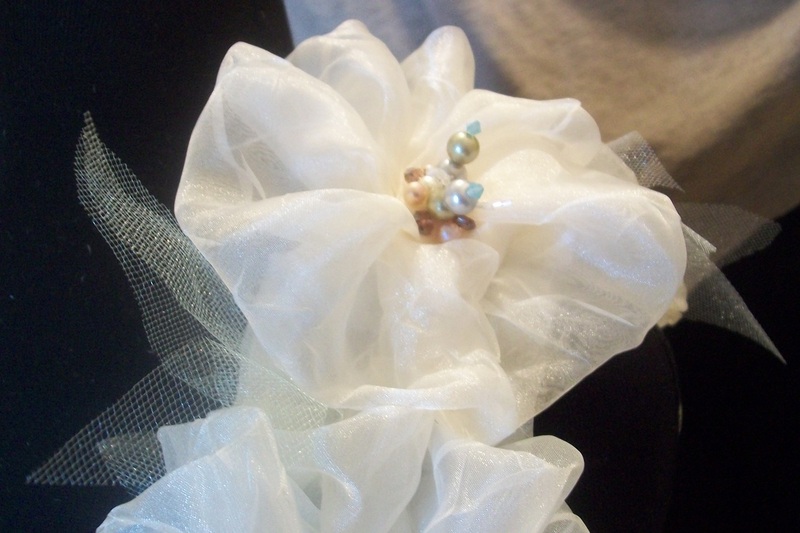 The beading in the rosettes can be customized. The Shrug is offered in silk shantung, taffeta, silk taffeta, satin, silk velvet and point d'espirit lace (not pleated) fabrics and can be dyed to suit any color combination. Sizes XS-XL. Please specify ,through email, the fabric selection, color choice and size when ordering. The company label is sewn discreetly in the neck of the collar. The Care Instructions are included with purchase. This item can be shipped in a lined presentation box or in a breathable cloth storage bag. Regular Price $100.00. 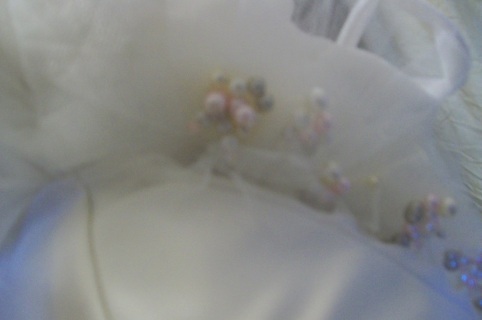 Close Up of Hand Beaded Rosettes. This image is property of Sun*Kissed Designs. Side View of Rosette Shrug. This image is property of Sun*Kissed Designs. 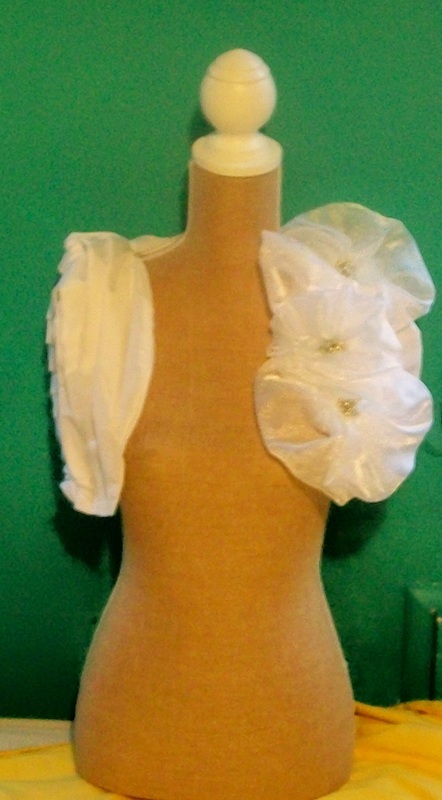 Back View of Rosette Shrug. This image is property of Sun*Kissed Designs. 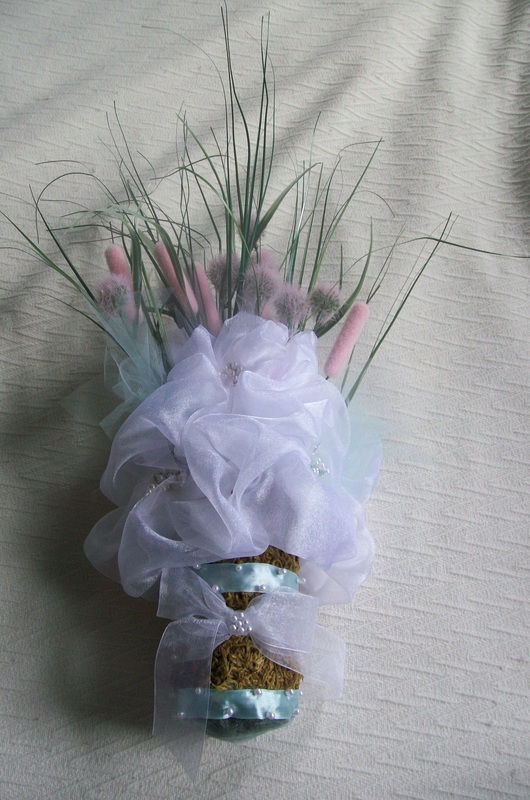 The Hand Beaded Floral Bouquet is the perfect floral arrangement for your wedding! 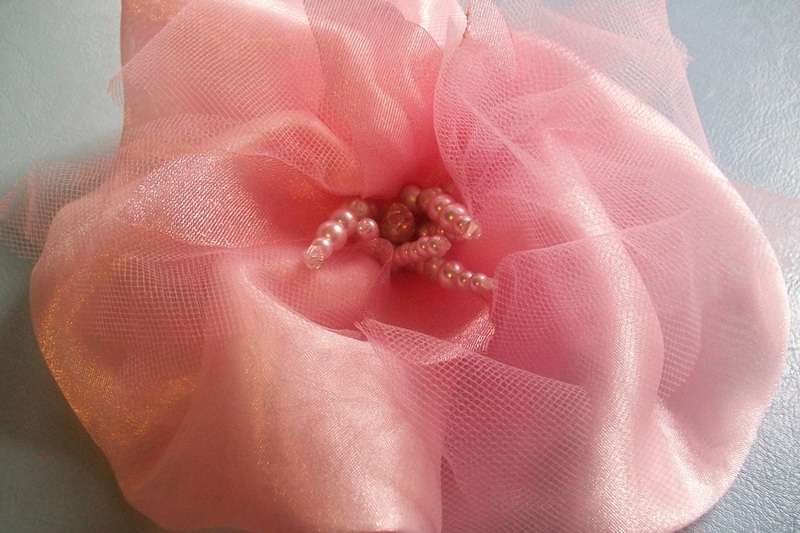 The hand beaded rosettes will remain intact for years to come and the colors, flowers and beading can be completely customized. Please correspond through email for custom requests. 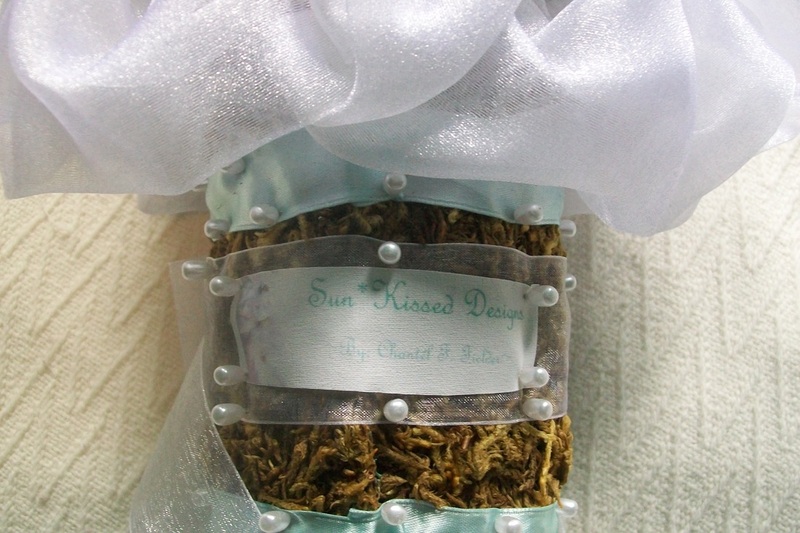 The company label is sewn discreetly on the back of the bouquet. The Care Instructions are included with purchase. This item can be shipped in a lined presentation box or in a breathable cloth storage bag. Regular Price $100.00. Close Up of Hand Beaded Rosette. This image is property of Sun*Kissed Designs. Back of Hand Beaded Floral Bouquet. 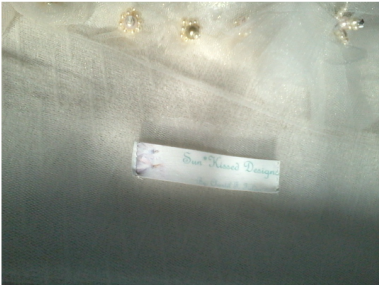 This image is property of Sun*Kissed Designs. All products can be customized and if there is an additional fee you will be notified immediately. If there is a product that you are interested in but is not listed above, or if you would like custom services for a product that you have that you would like for me to adorn, it would be my pleasure to serve you! Please email chantelfrancina@sunkissedbridal.com with your requests and inquiries. For more information or to submit custom requests, enter your information here.